Bio: Mack Johnson broke his back on November 5, 2016 after falling off a deck during a party. He was instantly paralyzed from the waist down. A simple twist of fate happened when Basketball Hall of Famer and major CAF supporter Bill Walton happened to meet Mack at “Dateland” on Bill’s way home from the 2017 NCAA Championship Game. He insisted that Mack drive straight to CAF to get involved. 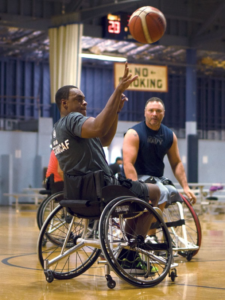 CAF then granted Mack a high-end competitive basketball wheelchair to use at a summer camp at Auburn University. He fell in love with the sport and Mack was offered the chance to play Division 1 Wheelchair Basketball at Auburn and he is now a full-time student there and playing for their wheelchair basketball program. Most recently, Mack participated in CAF’s Million Dollar Challenge bike ride from San Francisco to San Diego where he rode an average of 20 miles per day on a handcycle.